The 2019 meeting of the South Central Society for Music Theory will be held March 15–16 at Louisiana State University, Baton Rouge, LA. Baton Rouge, the capital of Louisiana, is served by two airports: Baton Rouge Metropolitan (BTR), 20 minutes north of LSU, and Armstrong New Orleans International (MSY), just over an hour to the south. There is no shuttle service from either airport to campus, so arranging vehicle rental or taxi/Lyft/Uber is recommended. A block of rooms is available in two hotels, one on the LSU campus and one near by. Both offer complimentary breakfast buffet. $139 for suite with King bed. Mention SCSMT when making your reservation. Rooms at Cook will be held for us until 2/21, at Staybridge until 2/14. Note that both hotels offer complimentary parking and internet access. There are many other hotels in the area if you prefer other options; all require driving to the venue. Baton Rouge, the capital of Louisiana, is served by two airports: Baton Rouge Metropolitan (BTR), 20 minutes north of LSU, and Armstrong New Orleans International (MSY), just over an hour to the south. There is no shuttle service from either airport to campus, so arranging vehicle rental or taxi/Lyft/Uber is recommended. Rideshare app services Lyft and Uber are also available in Baton Rouge and New Orleans. If you are staying at the Cook Hotel, walking to the venue is the best option (and it’s a nice walk). If you are staying at Staybridge Suites, the Tiger Trails bus service runs regularly and frequently to the center of campus. Parking on campus during the week is strictly regulation; all parking lots are free and open to the public on weekends. For Friday, parking options on campus include metered parking, parking at the Visitors Center, or the Union Square Parking Garage. 1. The Visitors Center is on the corner of Highland Road and Dalrymple Drive, a very short walk down Dalrymple from the Friday venue. For $10 visitors can park all day. 2. Metered parking on campus is primarily suggested for visitors. All metered spaces are in effect and should be paid from 7 AM to 10 PM, weekdays. The most convenient metered parking spots to the conference are on Tower Drive. The cost for metered parking is $1.50 per hour. Metered spaces are numbered. When parking, note your space number and pay at any designated pay station (see Meter Map for specific payment locations). 3. The Union Square Parking Garage is in the same building as the Barnes & Noble Bookstore, on the corner of Veterans Drive and East Campus Drive (access is on East Campus Drive). Visitor spaces are available on the second, third, and fourth floors for $1.50 per hour. Praised for “demon precision and complete dedication,” the Lomazov-Rackers Piano Duo boasts an expansive repertoire, from important works by Bach, Brahms, Mozart and Schubert to wide-ranging performances of Stravinsky’s Rite of Spring and Petrushka. Each of these restaurants is within walking distance from the School of Music Building. The Chimes. 3357 Highland Rd., Baton Rouge, LA 70802. (225) 383-1754. 10-min. walk. A college pub with Louisiana-style food and sudsy charm. Turn right out of the School of Music Building to walk north on Infirmary Dr.; turn right on Chimes St.; destination is at the intersection of Chimes St. and Highland Rd. Andreas Giger is partial to the crab-cake sandwich; Blake Howe, the duck and sausage gumbo; Brett Boutwell, the étouffée. Louie’s Café. 3322 Lake St., Baton Rouge, LA 70802. (225) 346-8221. 5-min. walk. Yes, it calls itself a café, but only to put on airs in front of company. In truth, Louie’s is a greasy-spoon diner, and a historic one at that. A fixture of the LSU campus since 1941, it feeds provosts, profs, and panhandlers alike. Turn right out of the School of Music Building to walk north on Infirmary Dr.; take the downward-sloping fork to the left onto Lake St.; look for the gaudy neon sign on your left. City Slice. 124 W Chimes St, Baton Rouge, LA 70808. 6-minute walk. (225) 388-5454. Pizza and Italian specialties, draft beer. Newk’s. 3332 Lake St., Baton Rouge, LA 70802. (225) 302-5742. 5-min. walk. The feather in the cap of Newk’s—a Panera-esque chain establishment with an array of sandwiches, salads, soups, and pizza—is undoubtedly its stone’s-throw proximity to the School of Music Building. Turn right out of the School of Music Building to walk north on Infirmary Dr.; destination is on your left at the intersection of Infirmary and Lake, tucked away from the street. The Club. 2 Raphael Semmes Rd., Baton Rouge, LA 70808. (225) 578-2356. Closed Saturday. 15-min. walk. Formerly “The Faculty Club,” now zippily rebranded “The Club,” this fine-dining establishment offers white tablecloths and wood paneling in a charmingly refurbished 1939 building. It offers a tasty all-you-can-eat buffet with salad, soup, main course, desert, and bottomless coffee as well as menu options. Turn left out of the School of Music Building to walk south on Infirmary Dr.; turn left onto Dalrymple Dr.; turn right onto Highland Rd. ; destination is on your left after the grandiose LSU Law Center. Koi. 217 W State St., Baton Rouge, LA 70802. (225) 387-5678. 10-min. walk. Sushi and other Japanese dishes (plus some Chinese and pan-Asian fare) in a small, dim, and refreshingly quiet environment, notwithstanding a small TV forever tuned to MSNBC. Turn right out of the School of Music Building to walk north on Infirmary Dr.; take the downward-sloping fork to the left onto Lake St.; then follow the curve to the right onto W. State St.; destination is on your right. Kaminari Sushi and Hibachi. 7982, 3260 Highland Rd #5, Baton Rouge, LA 70802. (225) 383-0999. 10-min. walk. With an all-you-can-eat option, Kaminari is the best value for Asian food near campus, but it is sometimes busy and noisy. It features a large buffet and more vegetarian options than one can find easily on campus. Turn right out of the School of Music Building to walk north on Infirmary Dr.; take the downward-sloping fork to the left onto Lake St.; then follow the curve to the right onto W. State St.; destination is in the shopping center on your left. 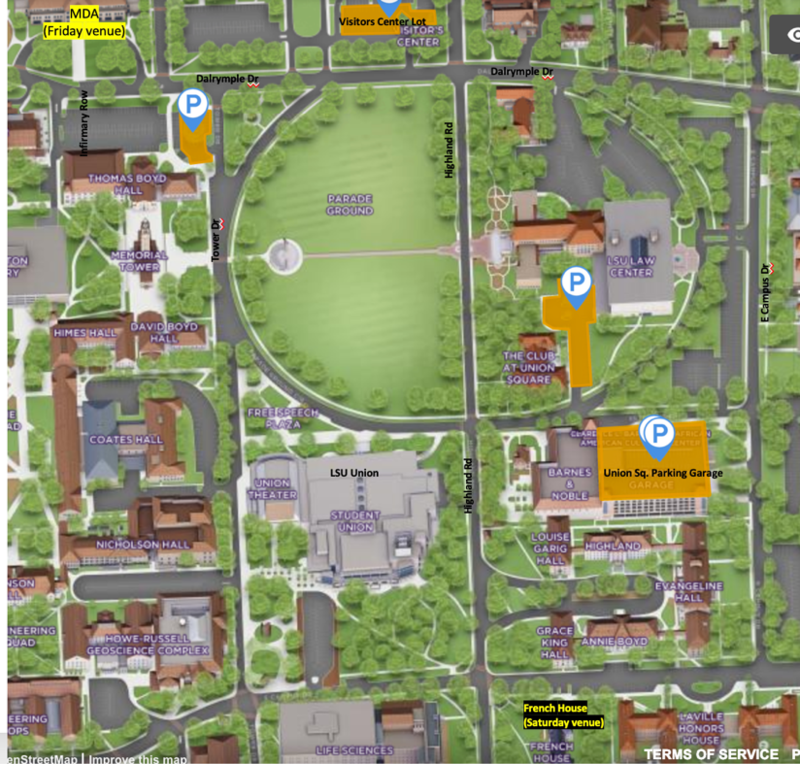 These restaurants will require a drive from the campus area and from most hotels. Parrain’s. 3225 Perkins Road, Baton Rouge, LA 70808-2256 (225) 381-9922. Exceptional local seafood. Many entrées consist of filleted local fish topped with crawfish, crab, or shrimp, broiled or panéed. Recommended: start with a dozen chargrilled oysters and/or a cup of gumbo or bisque. The more standard fried seafood platters and steaks are available as well. Bistro Byronz. 5412 Government St, Baton Rouge, LA 70806. (225) 218-1433. Civilized in appearance but reasonable in price, Bistro Byronz offers Louisiana-specific and broadly Southern cookery in a mildly genteel setting with a New Orleans soundtrack full of funky brass bands and Dr. Longhair-style piano. Only in Louisiana can one eat something called a “debris sandwich” in a restaurant with cloth napkins. The homemade chips with blue cheese are especially recommended. Roberto’s River Road Restaurant. 1985 LA-75, Sunshine, LA 70780. (225) 642-5999. Located twenty minutes from Baton Rouge in the tiny hamlet of Sunshine, Roberto’s is a perfect dinner option for visitors seeking a cultural experience to remember. Situated in an 1850s building that once housed a general store, this restaurant serves classic creole seafood dishes and delicious bread pudding. Follow the directions from Google to travel as the crow flies, or, if you have 45 minutes to spare, take River Road south from Baton Rouge and allow the meandering Mississippi to guide you as it once did Twain’s Huck. The eighteenth-century St. Gabriel Catholic Church stands a few miles away on River Road; give it a look. Elsie’s Pie & Plate. 3145 Government St., Baton Rouge, LA 70806. (225) 636-5157. The “pie” in the name refers both to savory and sweet varieties, and they’re served at Elsie’s with Louisiana panache. When will you have another opportunity to eat something called a “Natchitoches Meat Pie”? A “crawfish hand pie”? Never, that’s when. Rocca Pizzeria. 3897 Government St., Baton Rouge, LA 70806. (225) 478-1286. Wood-fired, hand-tossed, Neapolitan-style pizza, probably the best in Baton Rouge. Digiulio Brothers Italian Café. 2903 Perkins Rd, Baton Rouge, LA 70808. (225) 383-4203. Italian cafe with a mix of classic & creative dishes plus Sunday brunch with a Cajun influence. Due to the large Vietnamese population in Southern Louisiana, Vietnamese cuisine occupies an impressive niche in the region’s restaurant scene—albeit one often overlooked by visitors. Many also serve a full sushi menu. Drunken Fish. 4410 Highland Rd, Baton Rouge, LA 70808. (225) 248-6391. Full sushi bar but actually a great place for Pho and banh mi. Just outside the gates of LSU. Ava Street Cafe. 5207 Essen Ln., Baton Rouge, LA 70809. (225) 960-2380. Offering Vietnamese food with Japanese and French influences, Ava Street Cafe is a fabulous recent addition to Baton Rouge’s expanding Vietnamese restaurant scene. Highly recommended to anyone who enjoys Asian fare in general. Bao Vietnamese Kitchen. 8342 Perkins Rd., Baton Rouge, LA 70810. (225) 960-1293. The broth in the brisket pho at Bao is truly a thing to behold. If the weather is pleasant, sit outside on the patio and enjoy a nice meal. If it’s not, sit inside the restaurant, which, to judge by its shape, might once have been a mechanic’s garage. Lebanese and Greek. Louisiana also has a long history of Lebanese immigration, as witnessed by Baton’s Rouge’s large number of Mediterranean restaurants. Serop’s Cafe. 7474 Corporate Blvd., Baton Rouge, LA 70809. (225) 201-8100. With several locations in the city, Serop’s is arguably the king of Lebanese restaurants in Baton Rouge. The location on Corporate Boulevard offers table service in a quiet and pleasant setting. There’s plenty to eat for vegetarians here, and the mujadara is especially recommended. Bay Leaf Indian Cuisine. 5160 S Sherwood Forest Blvd, Baton Rouge, LA 70816. (225) 291-4250. If you prefer to get your butter and cream through Indian cuisine rather than Creole cookery, Bay Leaf is for you. It’s a remarkably good restaurant with an assortment of delicacies from both North and South India. They say that the lentils in their dal makhani are slow-cooked in spices overnight, and I believe them. Curry and Kabab. 11904 Coursey Blvd, Baton Rouge, LA 70816. (225) 372-5002. Cooked-to-order Indian specialties. Don’t be put off by the nondescript exterior. The owner will interview each diner and determine their preferences before recommending dishes that are to your liking. Intimate setting. Kitchen closes at 8 PM. Thai Kitchen. 4550 Concord Ave, Baton Rouge, LA 70808. (225) 346-1230. Standard Thai options such as curry & noodles as well as sports bar area serving sushi rolls.